Have you ever sat down with a tub of a ice cream and a spoon to melt away all your troubles? I know I have! Did you know that ice cream has statistically been proven to be the ultimate comfort food (only behind chocolate, of course!)? Over half of us fabulous Australians, looking for a way to momentarily escape the stress and pain we feel, turn to comfort foods at least once every week. These foods, whether it’s ice cream, chocolate, or mom’s home cooking, trigger happy memories, like eating ice cream as a child, which make us feel better and is therefore why we crave comfort foods. What’s your favorite comfort food? And it involves hot chocolate and cold Peanut Butter Fudge ice cream. I’ll give you the details in a moment. But first, you knew that this is International Ice Cream Month, right? If not, seriously, where have you been? Lucky for you, though, you still have time to celebrate because Harry’s Ice Cream is running an Ice Cream Emergency competition that is open to all of you in Australia! All you need to do is tell Harry’s Ice Cream why you’re in desperate need of ice cream, along with the hashtags #HarrysIceCreamCo and #ICeCreamEmergency, and you could find a delivery of Harry’s Ice Cream at your doorstep! There’s a winner every day, so visit Harry’s Ice Cream on Facebook for all the details! Harry’s Ice Cream was so generous to supply me with a couple tubs of their brand new Peanut Butter Fudge ice cream (plus some Triple Chocolate Brownie ice cream and Sticky Date ice cream!) to create a recipe for International Ice Cream Month celebrations. I am in love with the Peanut Butter Fudge, so it’s only natural that I’ve used this one for my recipe! About this little concoction that I call a hot chocolate affogato with Peanut Butter Fudge ice cream. 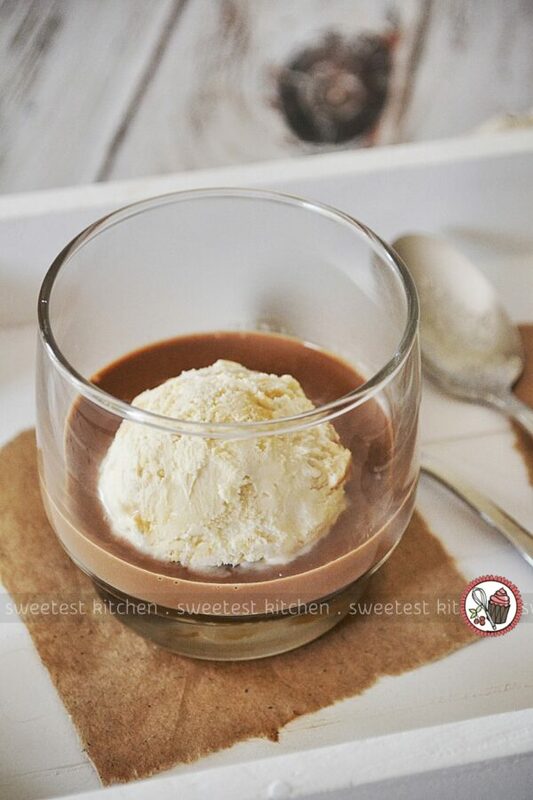 An affogato is usually all about ice cream and coffee, but what if you replace the coffee with hot chocolate? And not just any hot chocolate, but a really thick one that’s almost like a chocolate sauce. And then, what if you used peanut butter ice cream with bits of peanut butter fudge in it? I’d say that’s a pretty darn good idea. And a good way to still enjoy ice cream on a chilly evening when you’re craving you’re favorite comfort food. This is a really easy recipe and it’s super quick too. Just whip up some really thick hot chocolate, which involves a bit of milk, cream, cornstarch and your favorite chocolate. 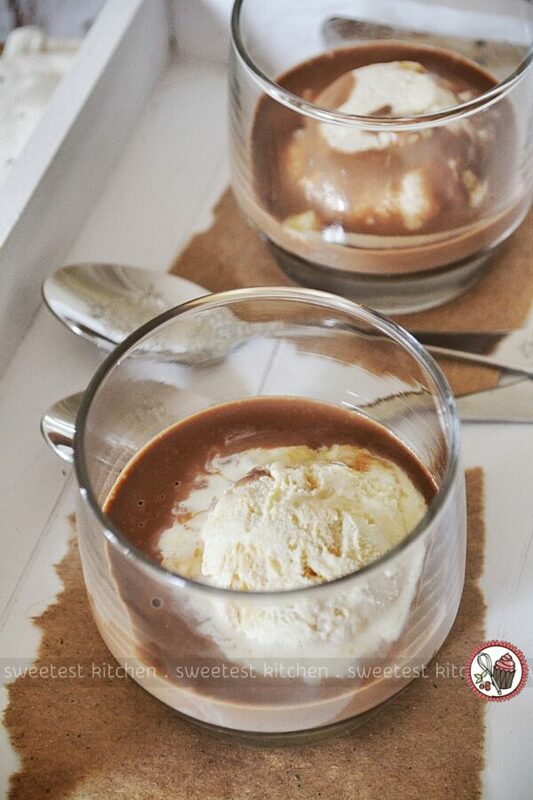 While that’s heating, place a scoop or two of Harry’s Peanut Butter Fudge ice cream in a serving glass or bowl. Then, pour the hot chocolate over the ice cream. Done. 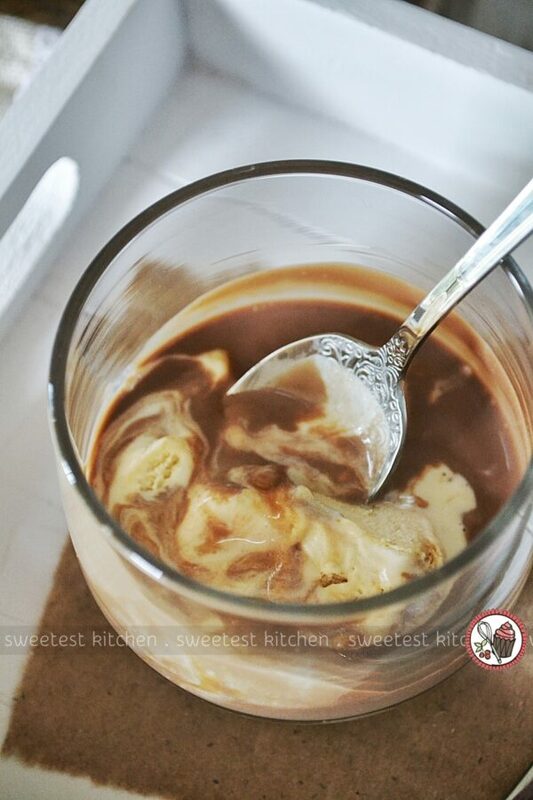 The ice cream turns all melty and the fudge becomes a bit gooey after you pour over the hot chocolate. I left mine sit for a minute or two so the ice cream became really melty. It was so delicious! 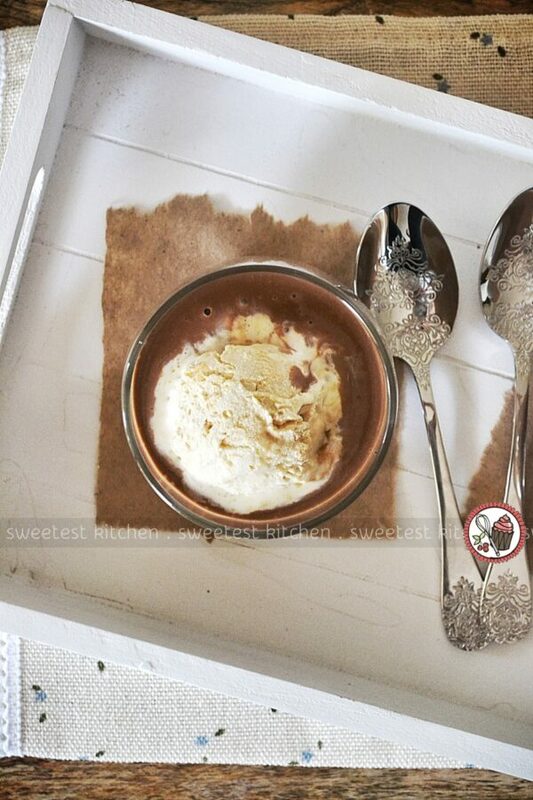 You can make this recipe with any hot chocolate (or hot cocoa), and you can use any type/flavor of ice cream. But if you happen to have all the ingredients for a thick hot chocolate, and you happen to have a tub of Harry’s Peanut Butter Fudge ice cream in your freezer, then make this right now! I really have no idea why you’re even still sitting there – get to the freezer now and celebrate Ice Cream Month! And don’t forget to tell Harry’s your ice cream emergency for your chance to win ice cream delivered to your door! 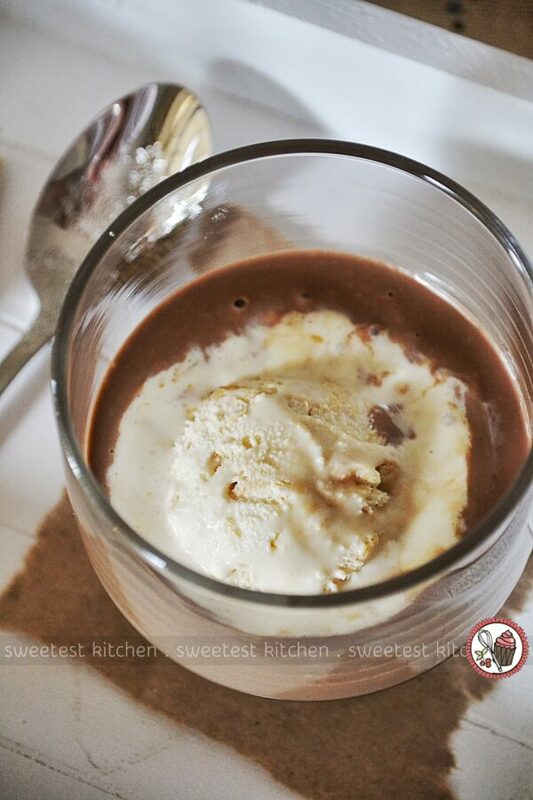 A rich, thick hot chocolate affogato with peanut butter fudge ice cream. Pour milk and cream into a small saucepan, whisk to combine. Remove one tablespoon and place into a small bowl with the cornstarch. Stir until cornstarch is dissolved. Set aside. Heat the remaining milk to just below boiling (but not actually boiling), whisking occasionally. Add the cornstarch mixture and whisk until thickened slightly, around one minute. Remove from heat and add the chopped chocolate. Whisk until the chocolate is completely melted and combined. If it doesn't melt fully, place back over the heat, on the lowest setting, and whisk until melted. Place one generous scoop of ice cream in four serving glasses or bowls. Pour the hot chocolate (around ¼ cup, or a bit more if you're serving less people!) over the ice cream. Let sit for a minute or two for meltier ice cream, if you like. Hey Jamieanne, its delicious recipe of ice cream have great mixture of chocolate and peanut butter. I love this recipe and thanks for sharing it with us. What a stunner of a recipe – I always, always want PB in all my sweet things. And what a beautiful blog you have.